3 works by George Negroponte in his exhibition at Anita Rogers Gallery, including, center, Gravel Road. 2016. Enamel and latex on cardboard. 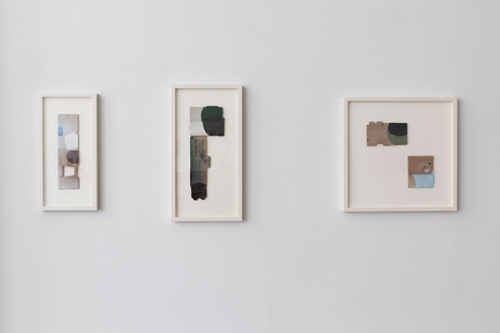 18.5" x 7"
Despite the show’s title, an alluring softness pervades George Negroponte’s new work in his exhibition, “Gravel Road,” at Anita Rogers Gallery in Soho through January 7. Shaped bits and pieces of cardboard serve as his support. Porous and absorbent as this material is by nature, the deep tan of the cardboard radiates a muted, soothing light recalling the earthen grounds of Vuillard, like whom the work is understated, inviting, intimate. Warmth of ground is balanced, in Negroponte, by a predominately cool palette, though occasionally a fire engine red blasts out from his deep browns, rich greens, blacks and whites. The irregularities of these disassembled boxes makes unpredictability a given. The rounded, overlapping, disk-like forms in the exhibition’s title work, for instance, may suggest stacked vessels, but they find themselves in an interior space rather than the cosmos. As in earlier work, Negroponte will occasionally pair smaller pieces in intriguing combinations. The ensuing dialogue has the animated tension of children sizing each other up in the playground.